Colorists are simultaneously artists, chemists and therapists rolled into one. Sometimes, your clients even expect you to be a magician—blonding broken strands, going from dark to pastel in a single appointment…you know the drill. With that, it’s important to maintain your own integrity with your color knowledge, skills and expertise, no matter what requests are thrown your way. 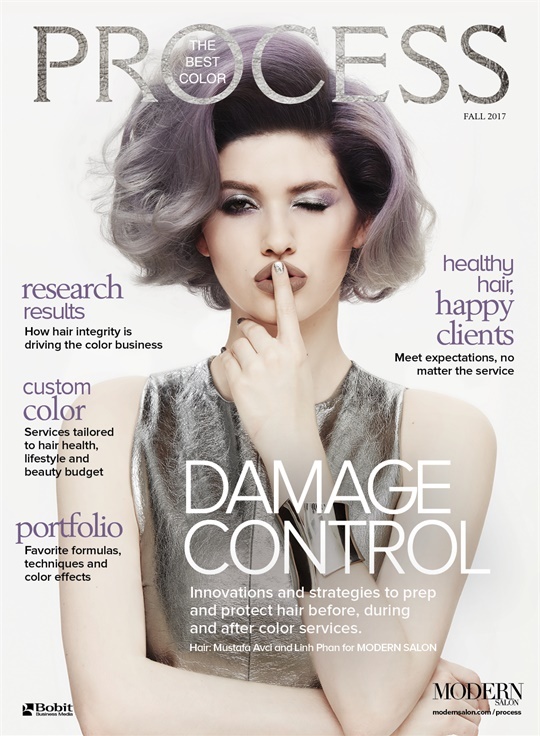 Integrity is the overarching theme of this third-annual PROCESS haircolor supplement. This year’s PROCESS research study shows 75% of all respondents reported clients are more interested in the health of their hair than they were two years ago, proving hair health is the main concern for clients now more than ever before. Of course, integrity deals with assessing the condition, strength and health of the hair, but it can also have many other meanings. It’s the confidence to say no and offer alternate solutions such as extensions, being transparent in a consultation, prepping and formulating in a purposeful way, offering individualized services for every client, managing your client’s expectations, using quality products in the salon, and sending clients to checkout with an at-home regimen. Watch for more inspiration and ideas at modernsalon.com/process. And, once you achieve beautiful color looks, share them to your Instagram and make sure to tag #modernsalon for a chance to be featured on our page. Through each look-and-learn seminar we report on, classes we participate in, and time we spend talking with colorists, your passion drives our team. We are inspired to deliver the most up-to-the-moment trends, tips from industry experts and new product knowledge for you to be successful in your careers. Thank you for making the world a more beautiful place with each and every client. Bridge the gap between permanent hair color and direct dye with ChromaSilk VIVIDS Everlasting.